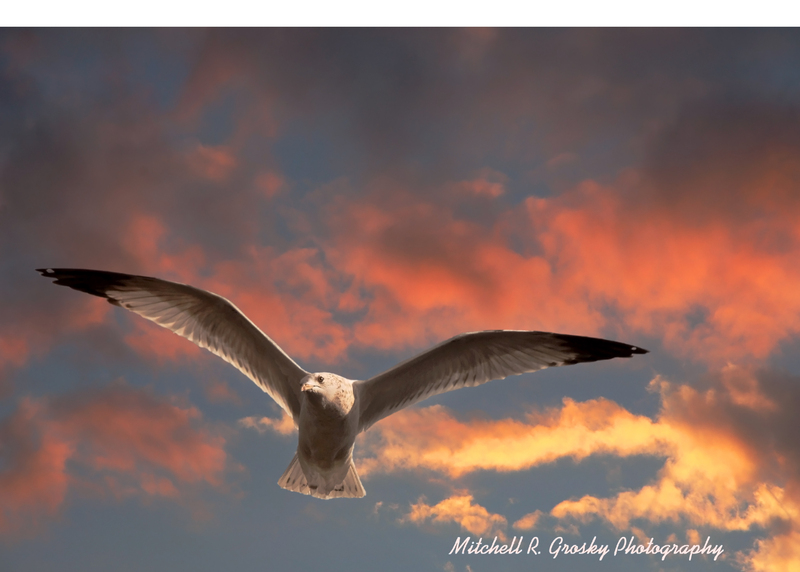 My Nikon D200 and I captured this seagull on my way to Mt. Washington a couple of weeks ago. The sky was grey, and I decided that he (or she) would look considerably better against a colorful sky. Hence, I went back to a sunset I had taken a couple of years ago, and did a cut and paste to combine the two images. Settings for the seagull were the following: focal length: 135mm, f 10.0, esposure of 1/500, ISO 320. I like the photos at sunset as it adds lots of colors. Thank you very much, Jack! Happy Holidays! Ever thought about makeing it into a postcard? Great photo! Thanks for the suggestion. I may very well do that! Happy Holidays! Thank you so much, Jeff! Hope you are having a great holiday season! Seems to have worked, Mr. G! Photo has a lot of impact. BTW, thank you for adding me to your blog roll! Just added yours to mine. Thank you very much, Scott. Merry Christmas to you and your family!